feet apart they stare into a mirror. is the void. a carpet. the absence of a rug. (it must be strange. alone. we change names the same way. is hot. winter is not cold enough. (men are not built in motion. As couch. A few years from now. I sit &expect you among others. you recall the viola player’s face? You arrive late under a large, Russian satellite. Refusing Heaven. Like a crucifix. You take the seat across from me. Adjust your awkward antennae. Channel your suffering. bookshelf where poems go missing (which poem. at my chest and wait for the heart to answer. our bodies took shape in a painting I’d make. Near the place where men kill chickens. one or the other is forgotten. Shake Off The Dust for City College’s Lit. Mag. Remember your New Year’s resolution to dig out your artwork and finally show it to the public? Now is the time. Forum, City College’s literary magazine, invites contributors to submit poetry, photography, stories, screenplays, music, creative nonfiction, and/or visual art. Selected work will be exhibited in their semiannual publication. Their website provides all the nits and bits on how to submit and upload your creation for magazine editors to evaluate. 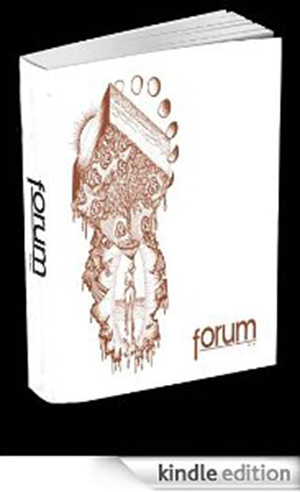 Forum Magazine is a vehicle for students to expose their work. It is also open to former students, teachers, staff and anyone associated with City College. Now on volume eight and released twice a year during spring and fall, the periodical also has an online presence and a digital version available. John Isles and Steven Mayers co-teach English 35 intro and intermediate literary magazine classes which is part of the English department’s certificate program in creative writing. In addition, students also become members of the Forum Literary Magazine Club. Professors Isles and Mayers invite literary icons to include their pieces and participate in readings. Two such icons are fiction writer and poet Alejandro Murguía, chair of the City College Latina/Latino Studies Program as well as the current Poet Laureate of San Francisco. Another is University of San Francisco professor D.A. Powell also an internationally acclaimed poet. Contributors may submit more than one piece, uploaded individually. The deadline is Feb. 23, 2016, but the earlier the better in case the organizers need additional details.